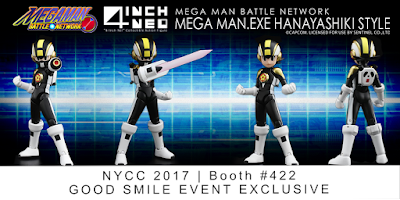 Rockman Corner: Bad Mega Man Volnutt, Hanayashiki Style Mega Man.EXE Coming to NYCC, Too! Dang it, I still want the panda MegaMan.EXE figure! 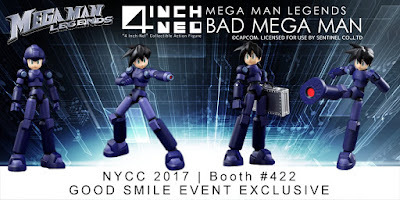 Why couldn't they make it available for online purchase on HLJ or something? That's quite a bargain. Usually it goes for over $100 elsewhere. Thank goodness for China. If not for them, I'd have paid a small fortune for those Cutman/Super Megaman and Adapter Megaman 2-packs. Naturally, THOSE don't get distributed via comic conventions. Just these unappealing wannabe recolors. kinda figured as much. but I think the ones from china are ironically bootlegs themselves. Lovely. I concur with the first comment. For those unable to attend one specific convention, the markup is probably going to be brutal. God, I hope not. I'll be keeping my eyes peeled on eBay all the same. I don't even live in america, so i won't grab thoses there. the exe figure looked nice. that said, goodsmile often have a stand in french manga conventions, so there's still a chance.